Google less than a week ago rolled out a redesigned version of Gmail featuring self-destructing messages, a snooze option and much more. Now, it’s Microsoft’s time. 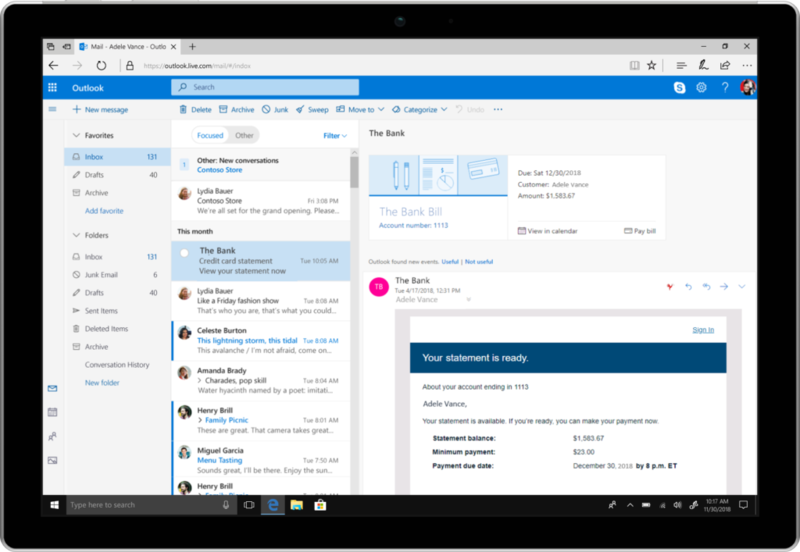 The Outlook team this week introduced a multitude of new Outlook features for Windows, Mac, on the web and on mobile devices that are collectively designed to help you better manage your time. Much like how travel reservations and package delivery notifications are handled, Outlook.com is getting bill pay reminders. The platform will identify incoming bills received via e-mail, present a summary card at the top of your e-mail and add a calendar event that coincides with the due date. Outlook can even send you a reminder e-mail two days before the due date so you don’t forget. 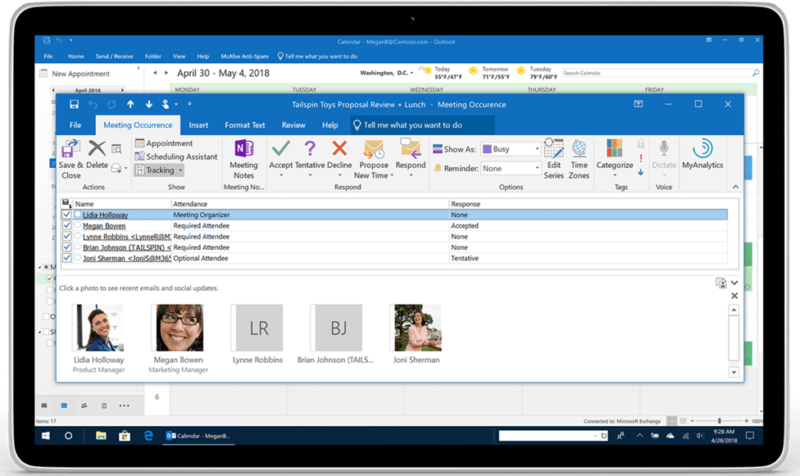 Outlook for Windows and iOS now makes it easier to add a meeting or event location, suggesting previously used rooms and locations and even pinging Bing for help. On iOS, suggestions take into account your location, the list of attendees, the proposed meeting time of day, traffic updates and more to help book the occasion and make sure you get there on time. Further catering to business users, Outlook now keeps track of events you’ve organized or plan to attend. By keeping tabs on who else is planning to attend, Microsoft says invited attendees can better manage their time and decide if they should attend or let a colleague handle matters. And, if you’re dealing with appointments and meetings across multiple time zones, Outlook can now handle that, too. Elsewhere, Outlook for Android and iOS now supports companies that use SOCKS proxies for added security. Also, in Outlook for Windows, there’s now blind copy protection to help avoid potentially embarrassing e-mail replies that could be seen by all recipients. Outlook for iOS is also adding support for syncing draft messages, allowing you to start a message on a mobile device and finish it up back at your desk (or vice versa). This feature is already available on Windows, Mac and Android and will be coming to Apple’s mobile platform this month. Outlook for Android, meanwhile, is getting Office Lens support this month. With it, you’ll be able to quickly and easily capture a whiteboard, document or photo and embed it within your e-mail message. Look for this feature to arrive sometime this month as well. Other new mobile features including quick reply and favorite people are additionally coming in the near future. 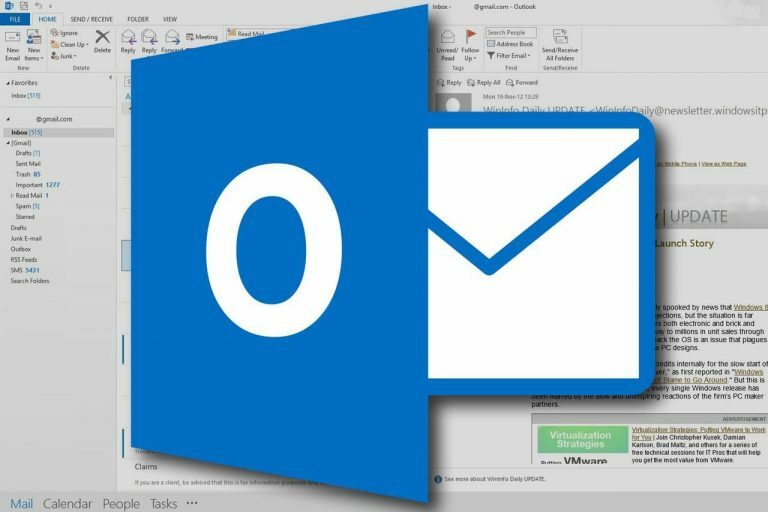 More details on those can be found in Microsoft’s extensive blog announcement from the Outlook team. I wish they'd add the feature of reliability... that would be nice. I've found the opposite to be true. Outlook on PC and Android has been one of the more reliable email clients I have ever used. Now, if you're referring to that weird "not-an-outage"-outage that Outlook the email service had last week: yeah, that sucked and was really inconvenient. How are they not reliable, exactly? Genuine question, Outlook is rock solid for us. The main problem with Outlook right now is the Mac version missing features that are in the Windows version. There needs to be better parity. It's actually pretty good, I was just in grumpy mood when I posted that. But Outlook does have some bugs and issues here and there. One issue that I've been seeing with 2016 is users not getting any indication that Outlook isn't sending your emails. Outlook will show "Connected to Microsoft Exchange" and "All folders are up to date." yet emails will be sitting in the outbox not going out. Users will have to go to the Send / Receive tab and hit the send/receive all folders button, then suddenly the emails all go. No rhyme or reason, Outlook just doesn't send your emails sometimes. Now sure if you keep an eye on the Outbox folder and see there are unsent emails that great but not everyone does that, or even has the Outbox displayed in the navigation pane. We've made sure we have all the Office updates but the problem still occurs from time to time. It is a more recent issue, so I'm assuming one of Microsoft's update has broken Outlook in some way. I'm in it 30-35 hours a week so I'm bound to see even minor issues. Half the time a new Outlook profile solves it, so clearly there is some sort of corruption going on. Unfortunately it is quite frequent now that a Microsoft updates break something in one way or another. Often times it is by the update reverting or changing a setting that is set by group policy. Overall Outlook is pretty solid I'll admit but it isn't perfect.